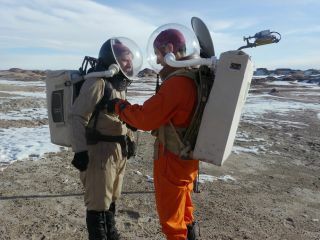 Crew 133 member Matthieu Komorowski (right) assists Joseph Jessup during a "Marswalk" at the Mars Desert Research Station, Jan. 8, 2014. HANKSVILLE, Utah — I used to think traveling through time would require climbing into a blue police box or using some similar device. After a week here at the Mars Desert Research Station simulating Red Planet exploration, however, I've learned that it takes only one ingredient to slow things down: novelty. Crew 133 engineer Joseph Jessup navigates a steep hill near Utah's Mars Desert Research Station, Jan. 8, 2014. Just before I entered the "Hab," at the Mars Desert Research Station, which is run by the nonprofit Mars Society, somebody asked me if I was scared to spend two weeks locked in a 1,200-square-foot (111 square meters) facility with five strangers. I wasn't, as I had spoken to all of them by phone and knew they were extremely qualified. My biggest fear, actually, was of being a slacker crewmember, or one who was creating a poisonous environment for others. I solicited help from friends who had experience in similar isolated situations. All information was valuable, but one phrase in particular ran through my mind nearly every day: "Keep half an ear on the boat." That quote came from somebody I know who has spent weeks travelling in foreign countries on a small vessel. No matter what else he is working on, he's always listening to the boat to make sure, for example, that the motor is running smoothly. I adopted the same thinking for the mission. If there was something I could do to make somebody else's life a little easier, I did it. My crewmates did the same in return, particularly when we worked on a required crew video. With one person on lighting and another on camera work, a complicated task suddenly became much easier. It was humbling to see them take time to help with my project. The "habitat" of the Mars Desert Research Station appears to blend into the landscape of its location in rural Utah. We still have a lot to do on the tail end of our two-week stay here, which wraps up on Jan. 19.. "Marswalks," for example, have shifted from getting used to the spacesuits to getting some valuable science done. We'll seek out some geological features in the region while one crewmember measures exertion inside the spacesuits. Cloudy weather and other circumstances meant we couldn't do as much astronomy as we wanted to. The forecast calls for clear skies in the next while, which means we could be lucky enough to see Jupiter's moons orbiting the gas giant, a focus of one of the projects out here. Meanwhile, we're trying to get even better at staying clean and using our consumables (power and water) here in the desert. I'm still figuring out how to get the dishes clean without using gallons of water, but my crewmembers are eager to help with that. I'm also getting better at turning the tap water off when soaping up my hands, then turning it on again to rinse. Our crew expects to stay out here until about Jan. 19, when we'll hand over operations to Crew 134 and go back to our home countries of Canada, the United States and France.